This beautiful weathered horn is off of a Sika Buck from The Wildlife Ranch in Mason, Texas. Horns like these are great for making lamps, knife handles, jewelry, decoration, and many other things. Great for any hunting enthusiasts or crafters! 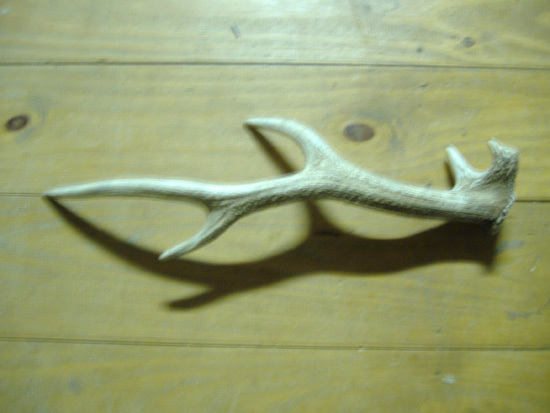 The main beam length off this Sika Buck Antler measure 16 3/8, The base measurement is 4 6/8". The length of the first point is 1", length of second point is 1 4/8", The third point is 3 7/8" The fourth point is 3 2/8".The mid beam circumference between second and third point is 2 7/8". The mid beam circumference between third and fourth is 2 1/2". Please remember this is a weathered horn.